They met on the WB lot. The year was 1944. — I just saw your screen test, —  Bogart said to Bacall. — I think we’re going to have a lot of fun together. —  And so it began — Listed as the Greatest Male Star of All Time and one the Greatest Female Legends by the American Film Institute, Humphrey Bogart and Lauren Bacall star in the all new Bogie & Bacall: The Signature Collection. This gift set includes all four films that starred one of classic Hollywood’s noted couples. Yes, it’s true: you can virtually see Humphrey Bogart and Lauren Bacall falling for each other in To Have and Have Not (1945), Howard Hawks’s variation on Casablanca but adapted from — as legend has it — Ernest Hemingway’s self-declared — worst novel. —  (The story goes that Hawks told Hemingway he could make a movie of the author’s least work, and Hemingway gave him the rights to this story.) The script by William Faulkner and Jules Furthman actually makes this one of Hawks’s and Bogart’s most interesting and often exciting films. Bogart plays a boat captain who reluctantly agrees to help the French Resistance while wooing chanteuse Bacall. Hoagy Carmichael, wry at the piano, adds a delicious accent to an already wonderful mood. Bogart and Bacall were never more popular than in The Big Sleep, the 1946 adaptation of Raymond Chandler’s novel, directed by Howard Hawks. 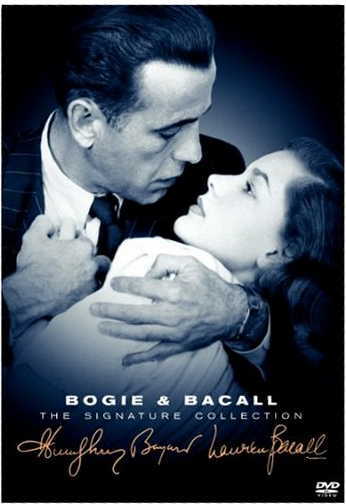 Bogart plays private eye Philip Marlowe, who is hired by a wealthy socialite (Bacall) to look into troubles stirred up by her wild, young sister (Martha Vickers). Legendarily complicated (so much so that even Chandler had trouble following the plot), the film is nonetheless hugely entertaining and atmospheric, an electrifying plunge into the exotica of detective fiction. William Faulkner wrote the screenplay. Dark Passage (1947) is a gimmicky film noir starring Bogart as an escaped criminal who undergoes plastic surgery and holes up at the home of Bacall’s character while healing and preparing to prove his innocence. If you can last through the first half-hour of this thing — which is shot entirely from the subjective view of Bogart’s bandaged face, which we don’t see until later — you might find ample reason in the stars’ performances to stick around for the conclusion. But director Delmer Daves (A Summer Place) tests a viewer’s endurance with such an obvious, attention-getting ploy.